"The era of the Gods was closing. Their once eternal rule had come to an end. The heavens trembled as the armies of Falis, God of Light, clashed with those of Falaris, God of Darkness. Their perpetual battle ensued. The earth wept. The seas boiled. In the end, each side had but one survivor: Marfa, Goddess of Creation, and Kardis, Goddess of Destruction. They met in a final battle that echoed to the ends of the earth. When it was over, a new land was born, broken away from the rest of the continent, and the last flames of the once-invincible forces of the Goddesses of Light and Dark flickered and died away. Thousands of years have passed, and now the land to the south of the continent of Alicrast has become known as Lodoss, the Accursed Island." - The Prologue of RoLW. 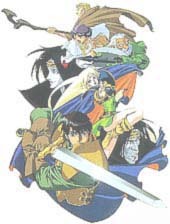 Lodoss has always been in turmoil, wars the norm and not the exception for thousands of years. Now, the tide of this bitter conflict is about to turn drastically for the worse, which is where an unlikely party of six join together under a common cause. There is Parn, the young fighter with an incredible destiny; Deedlit, the beautiful elf with deadly skill and a crush on Parn; Etoh, Parn's old friend and a priest of Falis; Slayn, a powerful wizard; Ghim, a tough old dwarf with secrets; and Woodchuck, the cynical but otherwise good-natured thief. The story is set in a war between Emperor Beld of Marmo and King Fahn of Valis, once the closest of friends. Beld is ready to send armies of darkness to strike without mercy. Meanwhile, the wizard Wagnard, Beld's advisor, intends to revive the Goddess of Destruction, Kardis, by stealing an ancient scepter. And all the while, the Grey Witch, Karla, makes her moves behind the scenes, manipulating everyone so that no one man has all the power. This is what these six must face ad they see sights, meet allies, and face enemies beyond imagination. It's Light vs. Darkness. The future of Lodoss is at stake, and the war has just begun.